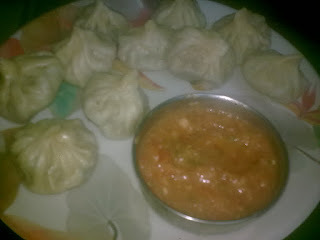 Momo or dumpling is a native dish of Tibet and it is also popular in the Himalayan states of India especially Sikkim.Momos can be made up of vegetables or meat or cheese.This one is a simple chicken momo recipe. Take water in a pan.Add some oil,chopped onion and garlic to it. Put in the chicken pieces and heat it. 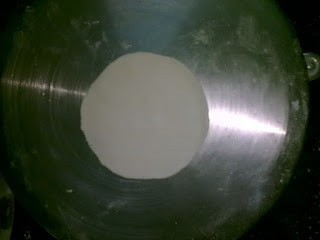 Get it to a boil.As the chicken boils white froth will come on the top,discard this froth by removing it with a spoon. Once the chicken is boiled turn off the flame. Remove the chicken pieces out and keep aside. Strain the water with the help of a strainer.This is the chicken stock.Chicken stock can be used in soups or stews. Take the boiled chicken pieces.Separate out the meat from the bones. 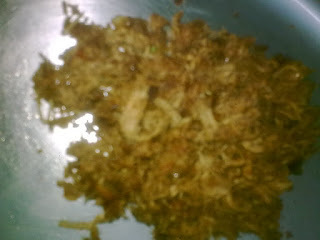 Now chop this chicken into small pieces which is now known as minced chicken. Add very finely chopped onion and ginger to it. Add black pepper powder and a bit red chilly powder. Put in the minced chicken and let it cook. Since the chicken is already boiled not much cooking is required. You might need to sprinkle some water if the chicken goes dry just to make sure it does not get burnt. Add salt to taste and some soya sauce.Be careful with the salt quantity as soya sauce is salty too. Once done take off from the heat and let it cool. Take maida and knead it with water to make dough. Take one ball and roll it with the help of a rolling pin.Check pictures below. 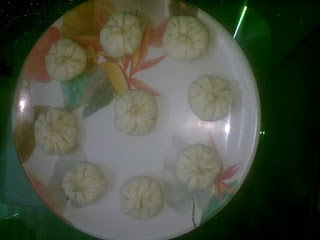 Put the chicken stuffing inside this and seal all the ends to give the shape of a momo. Similarly make momos out of the rest of the dough. Take a pressure cooker.Put some water in it. Place a stand inside the cooker.You can use any kind of stand,I have used the stand which we use to keep hot pots/pans. Arrange the momos on a plate and keep this plate over the stand inside the cooker. Close the lid and pressure cook it for around 15-20 minutes. Grind together tomatoes,lots of green chillies,garlic and salt to taste.